Maria Mihill nèe Hayden 1836 - 1922. In April 1923 the funeral of George Mihill took place with full military honours at St Mary’s & All Saints (new church) Langdon Hills. He was afterwards buried in the same plot as his wife Maria at the old St Mary’s & All Saints Church, in Old Church Avenue, Langdon Hills. Maria had died in October 1922. Their home address had been ‘Clapgate Cottage’. Dry Street. This couple’s story is quite remarkable. 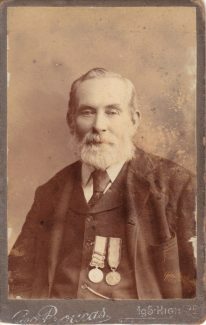 George Mihill was born 1838 in Purleigh, Essex and served in the 19th Regiment (1st North Yorkshire) The Green Howards (Regimental No. 332) in the Crimea War 1854-1855. He was wounded in the final battle for the Redan on 8th September 1855. One of his nurses was Maria Hayden from Australia who went to the Crimea as a nurse with Lady Blackmore and assisted Miss Florence Nightingale in nursing the wounded amongst whom was Corporal G. Mihill. Maria afterwards proceeded to India as Matron in Charge of women and children. George travelled to India where he fought through the greater part of the Indian Mutiny. He had many clasps and medals. Three years after their first meeting, George and Maria renewed their acquaintance while in India. George was invalided home and he and Maria returned to England together. They were married at St. Leonards, Shoreditch on 6th February 1861 and went on to have eleven children. By 1911 George and Maria were living at Clapgate Cottage, Dry Street. Shortly after celebrating their Golden Wedding Anniversary, the couple were interviewed for a newspaper article. Mrs Mihill was able to relate many stories about Florence Nightingale and her many acts of kindness. In 1921 Queen Alexandra was made aware of the old veteran couple and showed a kindly interest. Upon the death of George Mihill, William Skinner, the Chairman of the Parish Council, via a series of contacts, arranged for a Military Funeral to take place. The Essex Depot (Army) very kindly sent a funeral party from Brentwood consisting of a firing party, buglers and bearers by motor and a very impressive service was conducted by the Rector, the Rev F Clayton after which the coffin was carried by six bearers to the Graveyard of the Old Church some quarter of a mile distant and interred in the same grave that contained the remains of George’s wife Maria. At least 100 Parishioners were present at the graveside, being most solemn and touching. The grave was said to be in a very prominent position but as to date it has not been located. Note: A little about the photographer. The Greek artist/photographer George Boucas was born in 1879. He travelled to England in 1897 and opened a studio at 120 Mile End Road. By 1910 he had opened a photographic studio at 195 High Road, Ilford, Essex. In 1912 he opened a studio in Smyrna (Izmir, Turkey) and was the official photographer of the Greek royal family. 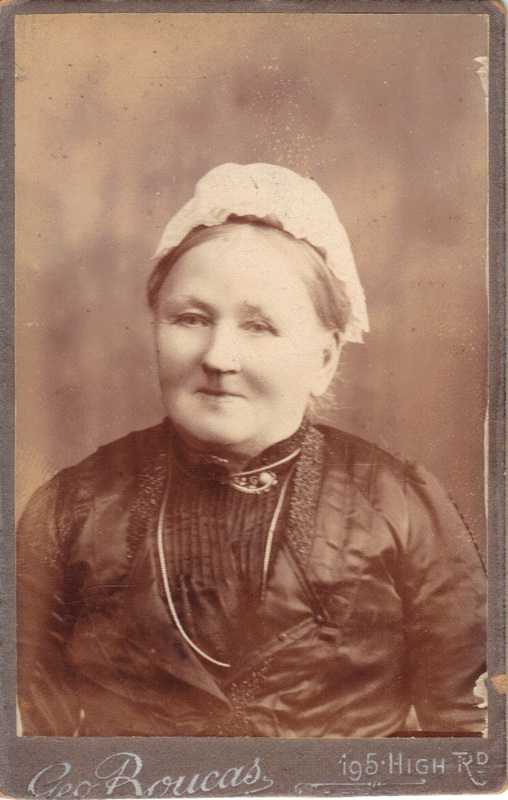 Maria was born in Bathurst New South Wales about 1838 to convict Thomas Hayden and Susan Jones. It is not known when she returned to the UK. (One of George and Maria’s children – Jane Matilda Milhill married James Swain in Essex in 1884 – that is my connection to the family i.e. James Swain – my father was a Swain). So pleased to have stumbled upon this article whilst researching my 2nd Great Grandmother (Maria and George’s daughter Jane was my Great Grandmother being married to my Great Grandfather (her first husband) James Swain. He in turn had a son called James, and then my father also James. I had often heard my father talk about his great grandmother who he said had nursed with Florence Nightingale but I assumed it was folklore got confused through the generations so lovely to have it confirmed. George and Maria sounded so happy – what difficult times they lived through. Furthermore, Maria came back to where she was orginally from – although being born in Australia both her parents were born in England. What an interesting article. I knew a lot of it already but had no idea what George looked like. It was great to connect photos and names and see family resemblances. My maiden name is Mihill. George and Maria are my great grandparents. Their son Frederick is my grandfather and his son Leslie is my father. My dad’s mum was Zena McKeown (nee Mihill), her dad was Frederick who was the son of Maria and George. So I’m the great great grand-daughter Catherine. Zena was born in India and moved to NZ from India in 1953. I was born in Auckland 1973. Mihill connections all the way to New Zealand. Incredible facts. I have enjoyed sharing these with my family very much. My great-grandmother Lilian May Mihill, was the daughter of Ambrose Mihill. My great-uncle regularly makes trips to France to visit the war memorial there. This branch of the Mihill family tree currently live in and around Chelmsford. Hello there. George William Mihill is also the Great Grandfather of my father George William Mihill the only son of Walter William Mihill and his wife Clara. My fathers Grandfather was Ambrose William Mihill who is remembered on a war memorial in East Ham Park. It is funny to hear some of the family moved to Westcliff-on-Sea as I, Paul William Mihill also live in Westcliff-on-Sea. Hi Nina – Interesting reading about Maria and George Mihill. They were, in fact, my great grandparents! My maiden name was Mihill and my father was George William (a family tradition for the eldest son to be so named). As Maria and George had so many children there are probably more! My father often told me of school holidays spent with them. I was born in Hawkesbury Bush Lane, off Bells Hill Road, and actually lived in Bells Hill Road until I was 16. I can remember Sunday walks along Dry Street, past Clapgate Cottage, going for a treat to ‘The Crown’. My parents, George and Alice, lived for the latter part of their lives in Pound Lane, Laindon and my sister and her husband lived for over 30 years in Basildon, so it seems the area had some meaning to the family in general. Wonderful to know more about the old couple – I knew the Crimea connection, but great to fill in a few blanks and the photos are priceless. Thank you Nina. Hi Nina, I found this very interesting, not least because George and Maria were my great-great grandparents. We knew their story but it is nice to see photos. The family stayed in Vange, my mother was born in Homestead Cottage in Dry Street, and later moved to Westcliff, where I was born. I still have relatives in the Leigh/Westcliff area. I loved reading your story Nina. There were some very interesting people living around our area. Great story.